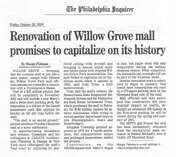 Willow Grove Park officials announced yesterday a mall renovation with a Victorian era theme. Part of the $25 million project that will be completed in November 2001 and will include a new Macy's and a three story parking deck, the renovation is a tribute to the famed amusement park that enjoyed its heyday on the site long before the mall. "The mall is on sacred ground," architect Frankie Campione said at a news conference. In manufacturing decadence and whimsy, Campione and his colleagues at CREATE Architecture Planning & Design in New York have redesigned the mall's food court by replacing its mirrored ceilings with drywall and bringing mosaic mural walls and table inlaid with original Willow Grove Park memorabilia. The mall failed to capitalize on its historical niche when it opened in 1982 said Judy Trias, a mall spokeswoman. Trias said the mall's owners, which purchased the mall in February for $140 million, pushed for interior renovations while trying to recruit another department store to join Bloomingdale's, Sears and Strawbridge's. Macy's construction began in July.